Check out our range of fun otter facts for kids. Learn where the otter lives, what they eat, what a group of otters is called, the names of various otter species and much more. Read on and enjoy our interesting information about otters. The otter is a carnivorous mammal in a branch of the weasel family called Lutrinae. There are 13 species of otter found all around the world. Some otter species spend all their time in the water while others are land and water based animals. An otter's den is called a 'holt' or a 'couch'. 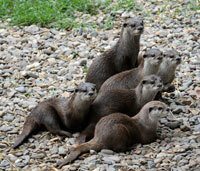 A group of otters are called a 'bevy', 'family', 'lodge', or 'romp', or, when in water the group is called a 'raft'. Otters live up to 16 years in the wild. Otters are very active hunters, spending many hours a day chasing prey through water or scouring the rivers and the sea bed. They mainly eat fish but also frogs, crayfish and crabs, some species carry a rock to help smash open shellfish. Otter species range in size from the smallest Oriental small-clawed otter at 0.6 m (2 ft) and 1 kg (2.2 lb). Through to the large Giant otter and Sea otters who can reach 1.8 m (5.9 ft) and 45 kg (99.2 lb). Four of the main otter species include the European otter, the North American river otter, the Sea otter, and the Giant otter. The European otter or Eurasian otter, are found in Europe, Asia, parts of North Africa and the British Isles. The North American river otter was one of the most hunted animals for its fur after Europeans arrived. Sea otters have also been hunted in large numbers for their fur. Unlike most marine mammals, otters do not have a layer of insulating blubber. Instead air is trapped in their fur which keeps them warm. The Giant otter is found in South America around the Amazon river basin. The otter is a very playful animal and are believe to take part in some activities just for the enjoyment. Some make waterslides to slide down into the water! Otters are a popular animal in Japanese folklore where they are called "kawauso". In these tales the smart kawauso often fool humans, kind of like a fox.